Please note that the content of this book primarily consists of articles available from Wikipedia or other free sources online. 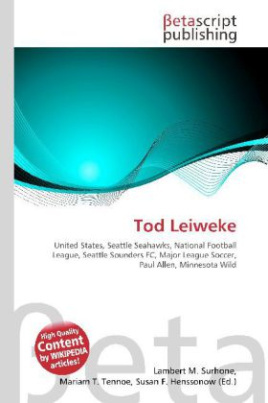 Tod Leiweke (born January 12, 1960, in St. Louis, Missouri) is an American sports executive. He is currently the Chief Executive Officer of the Seattle Seahawks National Football League team,and the Seattle Sounders FC, Major League Soccer team, both owned by Paul Allen; Leiweke also is the CEO of Vulcan Sports and Entertainment (VSE), a management company also owned by Allen which oversees Allen''s sports-related properties. Prior to his employment with Paul Allen, Leiweke has served as president of the Minnesota Wild, was the first executive director of The First Tee and has held executive positions with the PGA Tour, the Vancouver Canucks, and the Golden State Warriors.He currently lives in Mercer Island, WA with his wife, Tara, and his two kids, Tyler(19) and Victoria(17). Leiweke joined the Seahawks in 2003. The next year, the team advanced to Super Bowl XL, losing to the Pittsburgh Steelers.